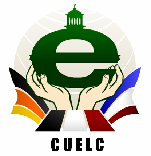 Over the next couple of days I´ll be attending a CUELC seminar in Cairo. I´ll accompany 4 of our best bachelor and master students to meet other students from Cairo University and INT Evry, France. The main goal of this seminar is the give students from different institutions the opportunity to get to know each other and exchange their experiences in the area of technology enhanced learning. Since the semiar will bring together students from different cultures, intersting would be to study the impact of different cultures on TEL. I´m looking very much forward to this event.